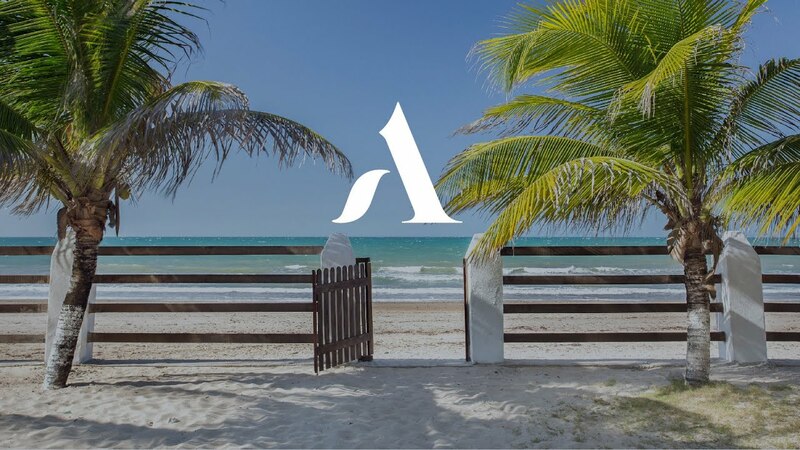 Stepping onto the ocean-facing terrace, tropical fruits and lobster curries await hungry guests on the outdoor table, and five hammock sway gently in the breeze, ready to welcome you for an afternoon siesta. A private pool, ping pong table, and trampoline are guaranteed to entertain your little ones, or even inner-kid. 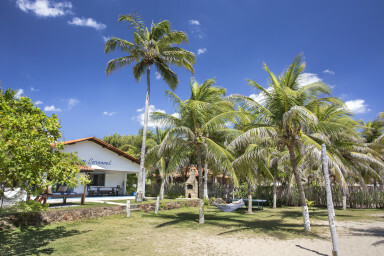 With five spacious rooms (three of which are en-suite), an enormous sofa and dining table, this beachfront villa in Taíba comfortably hosts ten adults. But in over here, life is best lived outdoors. The kitchen is large and has everything you need to prepare food if you wish, and the table large enough to sit 8-10 comfortably, as well as an outdoor table which can also sit 8-10. What really stands out about A Vida é um Carnaval is its service. 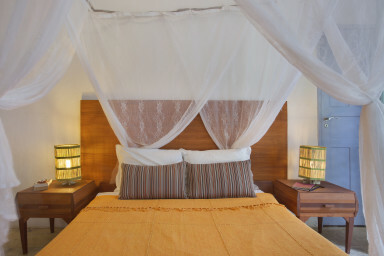 With staff included in the fee (apart from tips), we promise guests a five-star experience in a private villa. Nina, who lives on site in a separate house, is your holiday housekeeper. Cooking, cleaning, food shopping - these aren't words you'll need during your stay, as she'll take care of it all. And outside in the green gardens, the caseiro can be found - hand picking fresh coconuts, drawing the net through the cobalt-coloured pool, lighting up an evening barbecue or washing down your kiting kit after a long day on the water. For kite-surfers, we have an incredible service with our Kite Butler, Huelton. Sit passenger-side in a buggy and enjoy the views as he takes you to your favourite beach spot for a dose of daytime kite surfing. Enjoy downwinders knowing that a buggy is awaiting you on shore to zip you back home, race across the nearby dunes and catch sight of the simultaneous sunset and moonrise in the still evening air, and end the day at ease knowing that Huelton will be cleaning and packing up your kiting kit. And if your equipment needs repair, he'll nip it over to the shop for a quick service and deliver it back to you. The kite butler is available for a small extra fee. Come evening time, a night watchman will arrive to keep an eye on the property whilst you catch your forty winks. For those not interested in flying across the water behind a wind-powered kite, there is a long list of other activities for adventurers, and those seeking a little relaxation, too. On-site massages, private yoga sessions in the garden, an SUP ride downriver and galloping on horseback during low tide, to name a few. Nina: your on-site house staff, Nina is fantastic at preparing food, shopping including buying fresh fish from the market, making reservations, and so on. 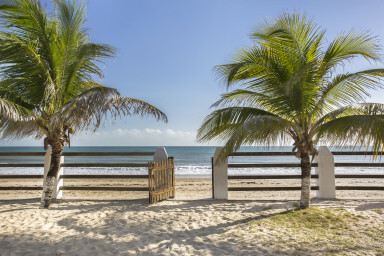 A fully-staffed beachfront home full of life & joy, ideal kite surfers with steps leading right onto the beach. The villas owners fell in love with this hideaway years ago. 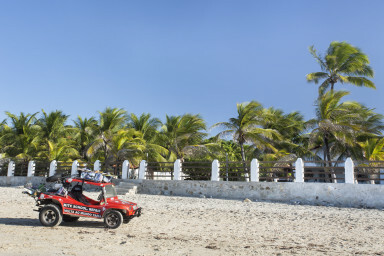 Keen kite-surfers, the location couldn't be any better with surfing on the doorstep, a tranquil lagoon only three kilometres away, and the prized 'secret spot' a buggy ride down the beach. 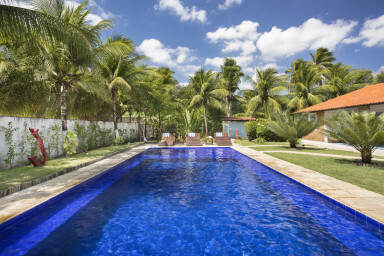 Whether you're looking to sit back and relax or dive head-on into adventure, A Vida é um Carnaval will have it covered. After a week unwinding in this sunny spot, we're sure you'll fall in love too. We can help to arrange everything from booking yoga or massages in the house, to arranging kite-surfing lessons and reserving your taxi/buggy. There is a freshwater lagoon where you can kite and train which is 3km on the other side of the bay. There is also a popular surfing spot just in-front of the house. Breakfast of Kings by the beach, every morning. Northeast Brazil is the wilder sister to that of the south. 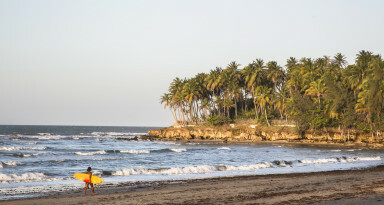 Soft-sand beaches stretch for miles, dotted by reggae bars and local seafood joints. Fishermen's villages line the coasts where wooden boats still bring in the day's catch, and come carnival time, pulsing speakers stretch for miles bringing musical beats and energetic crowds. 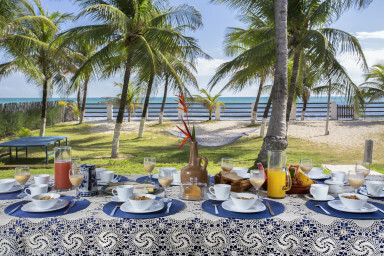 Within this great expanse, nestled between coconut palms stretching towards the sky and a powdery soft beach, A Vida é um Carnaval sits on the water's edge. In fact, it's so close, that high tide brings the waves gently reaching for the front gate. 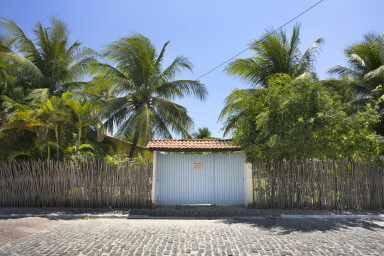 The house is a 90 minute drive from Fortaleza airport and we can arrange a taxi to do pick ups. Sign up for travelling inspiration and insider tips right to your inbox. We'll take you to places no others can. We will not share or divulge any of your information with third parties. The information provided will only be used to contact you regarding your enquiry.